On Saturday January 23rd we left Eusemere at 10 o clock in the morning, I behind Wm, Mr C on his Galloway. The morning not very promising - the wind cold. The mountains large and dark but only thinly streaked with snow - a strong wind. We dined in Grisdale on ham bread & milk. It rained all the way home. 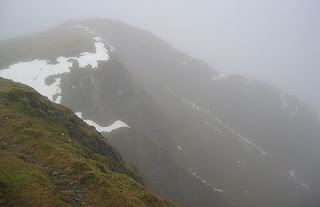 We struggled with the wind & often rested as we went along – A hail-shower met us before we reached the Tarn & the way often was difficult over the snow but at the Tarn the view closed in – we saw nothing but mists and snow & at first the ice on the Tarn below us, cracked and split yet without water, a dull grey white: we lost our path & could see the Tarn no longer. We made our way out with difficulty guided by a heap of stones which we well remembered – we were afraid of being bewildered in the mists till the Darkness should overtake us – we were long before we knew that we were in the right track but thanks to William’s skill we knew it long before we could see our way before us. There was no footmark on the snow either of man or beast. The Vale of Grasmere when the mists broke away looked soft & grave, of a yellow hue – it was dark before we reached home. Dorothy also records that later in the evening they settled down by the fire and read tales of the Alps where people were lost in the mist. Was this by way of comforting themselves that they were safe? In February of the same year Dorothy’s Journal notes that three men, coming the same way in the dark, were lost and found dead. This was danger that was lived with routinely. Not, as today, by recreational ‘hill walkers’ but by people going about their everyday business. Dorothy’s account of the walk is in one sense unremarkable, but it provides an evocative glimpse, as does much else in the Journal, of the everyday realities of life at the time and a felt identification with the landscape. The only intended reader was William who often consulted it to remind him of incidents which he then wrote about in his poems. Essential reading.